And the series continues with #16. It’s late, so I’m just going to say some of the things I like about this one. The artist’s canvas is a trapezoid. This was intentional, and part of the abstraction process in which a thing is conveyed with detail and a quality of naturalism, while not being illustrational at all. The model is a monster. Her name, if you are wondering, is “Suzy Chop Chop” (the lobster girl). The “artist” (no, it’s not me) looks a bit like a 50’s Chevrolet. Kinda’ hard to explain. You either see it or you don’t. That there’s a small painting within the painting. 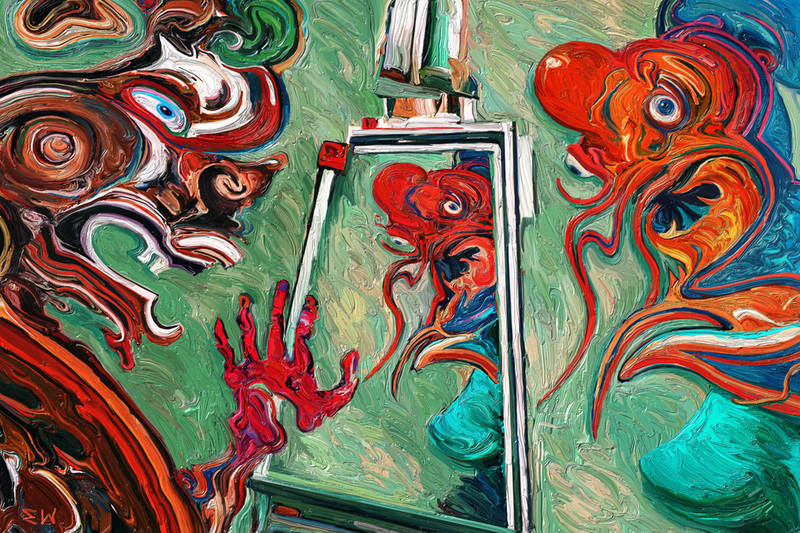 The overall mix of painterliness, abstraction, surrealism, and even sci-fi. There are a few like this is the series, mostly the later ones, and as far as I know this look is my own concoction. Here’s all 16 pieces in the series so far in a slideshow. Posted in art, New Series: Imagine ThatTagged art, contemporary art, digital art, Expressionism, painting, sci-fi, SurrealismBookmark the permalink. Oh great, someone likes it. I love the ones where it looks like the paint is on like cake frosting. This one reminds me of the Herzog painting at the mirror with the pox. I can never get too much green. Kandinsky said green wears on you over time but I don’t feel the same way, if done well that is. It is very hard to pull off, but I think you’ve done it. Hi Matt. You know the Herzog painting is by me, right? I also love green, and it is easy to use it too much, but I think that has to do with which shade of green. When I was younger my favorite color was red, and about blood red. Then it switched in my late 30’s to the green of a fresh rice field. I think it was triggered by a bike ride I took in Hoi An, Vietnam. through the countryside. Now it’s kind of ridiculous. I will prefer clothes or pots and pans or anything that is green. My mouse pad is green. If I see a green mug, and it’s the right green, I’ll definitely want it. Even though I have done paintings in green, I still fantasize about making a green painting, with that fresh grass green. You have a good sense of color. I remember you like the turquoises, too. Color is amazing, and it’s one of the things the conceptualists just don’t offer, but I’ll leave that for my next piece of art criticism. I’m please that you like the more impasto works. One follower wrote me, I think out of a little disappointment with the work I’ve been creating (he likes some of my earlier work), and mentioned not liking my digital impasto paintings. I don’t mind this. In fact I rather like that different people like very different pieces. What I’m a little less pleased about is how I seemed to have plateaued and am not reaching a wider audience. I would have hoped that this series would have picked up more momentum in terms of audience, but, alas, my latest pieces have as few likes or comments as my first ones. And the same goes for Instagram, and anywhere else I share my art. Every now and then I have the thought that no matter what I produce, no matter how good it is, it won’t make a difference. And then I start work on the next piece with an apparent endless supply of unwarranted optimism, or perhaps it’s just curiosity. And here it may be a good thing to not know the future. If someone told me a few years ago, when I started making art and blogging more seriously, that in a few years will will have the same following I had in my first few weeks of blogging, and will make almost nothing off of art, I don’t know if I’d have continued. And if someone were to tell me now that if I make 60 paintings in this series, it will come to precisely nothing. The last one will get 10-15 likes, there will be no bites from any of the online art magazines, just the same audience I’d have if I were sharing photos of my food (or likely less), I don’t know if I could go on. Except, there’s the intrinsic value in making art, the exploration, discovery, and expression. Speaking of Kandinsky, I have a greater appreciation of him these days. I sorta’ think the Abstract Expressionists didn’t really do much theoretically that he hadn’t covered. And I’m impressed you remember “Fanzilet in the Mirror with the Pox”. Bit of a long response, but you got me on my first cup of coffee (now black because I’m trying to cut out extra sugar). I wanted to say that I invented that digital impasto technique, though, I’m sure there’s “parallel development” and others somewhere have done some similar things, though we may never see each other’s work. I didn’t intend to use it as at all in this series, but then did for several in a row. The new one which I need to finish today doesn’t use it. I didn’t want it to be a crutch. You’ll see. The Herzog piece was about the time I first found your blog and hadn’t seen many of your works. I didn’t realize that was actually you at the time, but the piece has stuck I’m my mind. That green is like music to my eyes. I have a series of basically all green paintings that I did last year that are some of my favorite paintings I’ve done. I’m going to photo a bunch of my works this summer and put them up so you can see them. I’ll let you know when I do. In the world of art 99% is not great. Most people do it for money and fame and don’t really care about the actual art they make. Here’s the pattern that seems to happen in the history of art. A great artist has a vision and follows it their entire life. Most people think it’s terrible or even repulsive, except a few people who actually understand aesthetics’s. Then a cleaver artist who didn’t have a vision but sees the greatness in the genius makes some modest changes to the style to make it a little more acceptable to the general population. A few more people become ok with it. That artist gets some more followers who keep making modest changes to the original geniuses style. They are all proclaimed masters and geniuses. The original artist who was the only genius has died broke and alone and maybe some day down the road is recognized but is never seen as brilliant as his followers. I agree with changing styles and not using it as a crutch. It’s easy to fall into pattern of what has been working. But then you become more of a craftsman and no longer an artist. For me that just becomes work and at that point I may as well take a job and actually get paid.